Lime cordial is a non-alcoholic substitute for lime juice. It is sweeter and very similar to a lime simple syrup, yet there are a few extra ingredients. This lime cordial recipe is closer to the popular Rose's Lime Cordial, which is essential for a Gimlet cocktail. It is just as easy as making your own simple syrup. Stir acids and sugar together. Separately, bring water to a boil then add the sugar mixture. Stir constantly until the sugar is fully dissolved. Turn off the heat and add lime juice and rind and stir well. Turn the heat back on and allow to simmer for 1 to 2 minutes. Place the mix into a well-sealed container and refrigerate overnight. Strain the lime rinds and pour into an empty, clean bottle with tight-fitting lid. Place back in the refrigerator and allow to sit for another day before using. Don't forget to let your limes reach room temperature before juicing! You will get more juice from each fruit if you follow the rules: warm it, roll it, cut it. You can find citric acid in many grocery stores and tartaric acid online, at home brew and wine suppliers or natural food stores. Beyond the gimlet, you can use this lime cordial in many drinks, including one that is also called a "lime cordial." This is a fun and refreshing homemade soda: simply pour about 2 ounces of cordial into a glass filled with ice, top with club soda or ginger ale, and stir. You might also try using this cordial to add a lime flavor to a light beer. It is very similar to a chelada and a refreshing alternative to adding a lime wedge to your favorite Mexican beer. 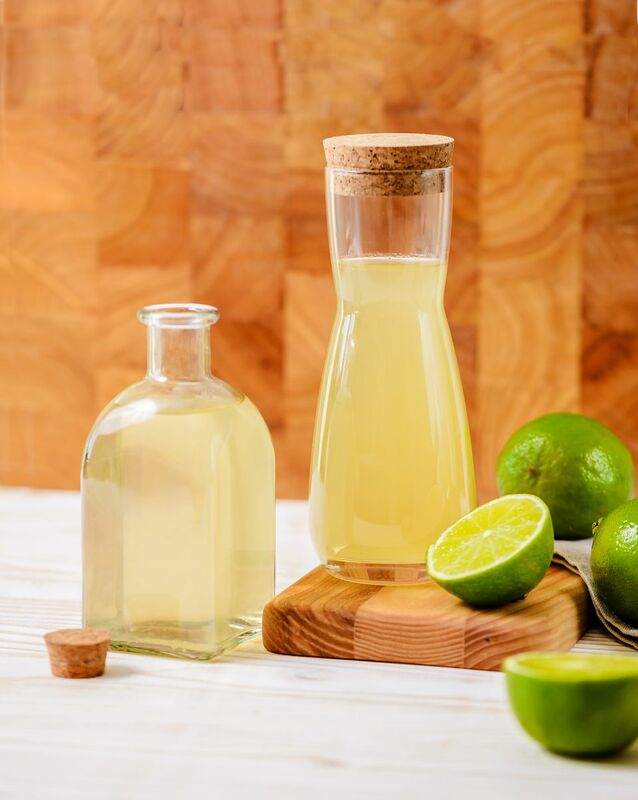 As an alternative to the lime cordial recipe, you can skip the acids and create a quick lime syrup less than an hour. It has the same great flavor and all you need is sugar, water and lime juice. Easy! The acids are used as preservatives and flavor enhancers, so you will not be missing out on much. However, I would still recommend adding citric acid if you can because it is the ingredient that really makes the flavor pop (you will see it used in almost every soda). Preparation: Bring the water to a soft boil in a saucepan. Add sugar and juice. Stir until the sugar is completely dissolved. Reduce heat, cover and simmer for about 15 minutes. Remove from the heat and allow to cool. Bottle in a container with a tight sealing lid and store in the refrigerator.